Long non-coding RNAs, including circular RNAs, are biologically important components of transcriptome and an exciting field of research. Due to the many unique properties different from mRNAs, the profiling poses special challenges. We will discuss the best practical technological solutions and showcase the successes with lncRNA and circRNA microarrays. • The challenges of profiling the transcriptome of lncRNAs and circular RNAs for their unique properties different from mRNAs. • Using lncRNA and circular microarrays as the best solutions. Please register now! After registering, you will receive a confirmation email containing information about joining the webinar. We look forward to meeting you online! Fig. 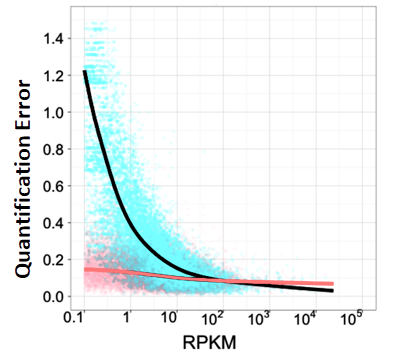 Compared with RNA-seq, the microarray signal accuracy is relatively unaffected by the transcript levels at low abundance. •nrStar™ PCR Array Service New! •LC-MS tRNA Modification Analysis Service New! ©2019 Arraystar Inc. All Rights Reserved. © 2019 Arraystar Inc. All Rights Reserved.